Political Participation Through Creative Action. The streets are covered in red and white banners, lively (and often heated) exchange of rhetoric and memes grace social media feeds, and the mass media is constantly updated with news of Joko Widodo, Prabowo Subianto, and their coalitions. More and more people are voicing their opinions of the candidates, because in a little more than a week Indonesians will go to the ballot box to elect the country’s next president. 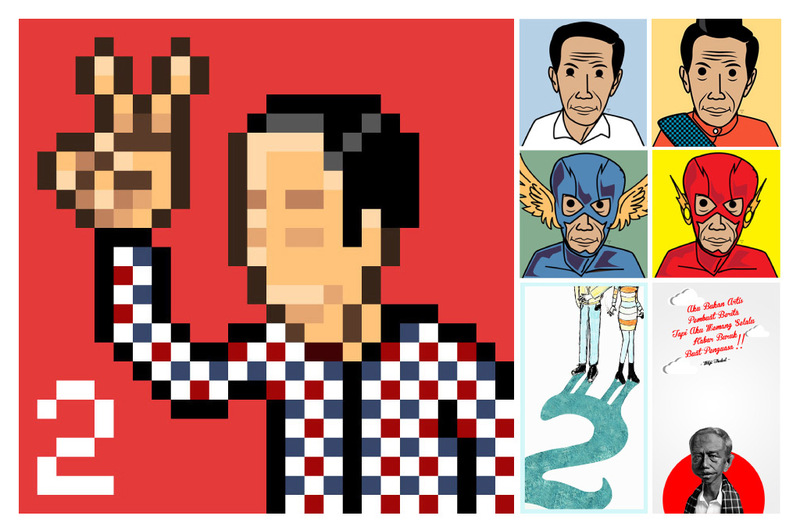 Among the many independent campaigns that have surfaced, inspired individuals have produced artworks to support their preferred candidate, including the website – Dari Rakyat Untuk Indonesia [From the People for Indonesia]. The site has found a niche where they, along with the website’s many contributors, share their enthusiasm for Jokowi by channeling their creativity. The site encourage supporters to create and share art relating to Jokowi, resulting in vibrant and positive participation of professional and amateur artists. When asked why they created the site, the two explains that “We first wanted to simply create artwork for Jokowi, but then realized that there were many like us, so a ‘place’ was needed – like a bowl that can hold and accommodate the works supporting the cause.” After finalizing their concept, Lala and Anggun then sent out an open invitation to their friends as well as the public to contribute. Although the response was sluggish at first, Dari Rakyat Untuk Indonesia was soon flooded with submissions. Scrolling through their blog-formatted website you will find everything from illustrations, photography, music videos, digital imaging to commercials in support of Jokowi. Ruang Rupa residents The Secret Agents (Indra Ameng & Keke Tumbuan) and Oomleo submitted artworks in their signature styles. 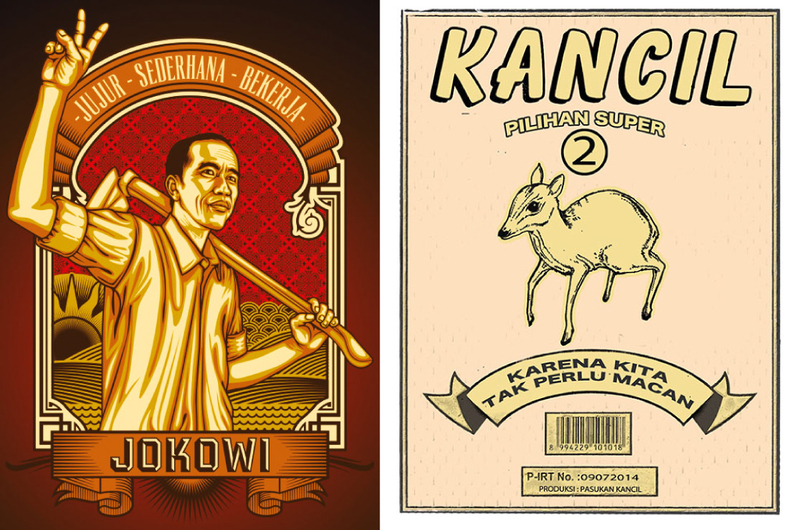 Hari Prasetio’s “Kisah Blusukan” series makes the site, where the artist illustrates Jokowi doing different activities in different parts of Indonesia. 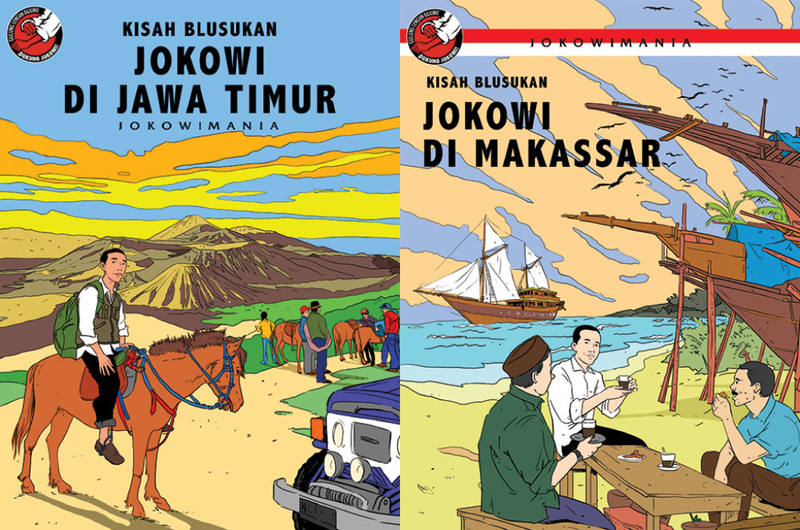 Hari’s illustrative style is reminiscent of Herge’s Tintin, adding a nostalgic warmth to images of Jokowi playing football in Papua, and riding a horse in a setting that seems to be Bromo mountain, East Java. Kamera Ria Safari, which consists mainly of Anggun Priambodo and Tumpal Tampubolon (of the recent Rocket Rain film), created a series of videos under the title of “Jangan Takut Indonesia” (Don’t Be Afraid, Indonesia). 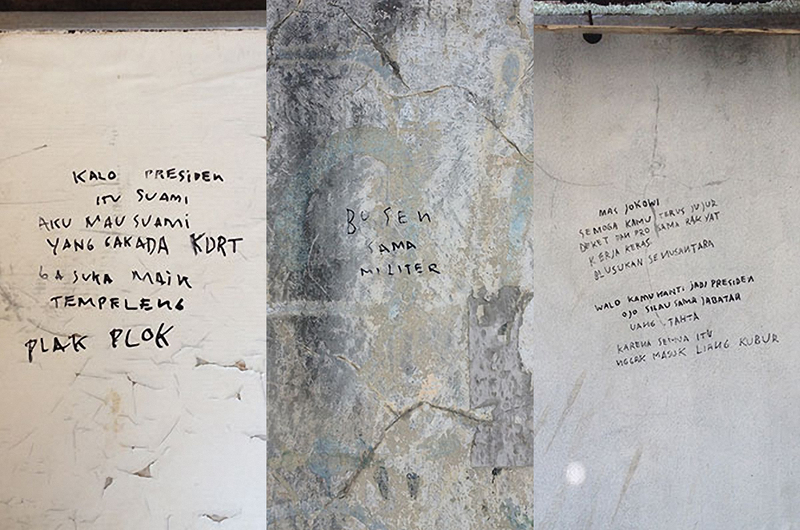 Each video addresses a particular theme related to the elections through funny and awkward situations in a zoo, such as “Jangan Mau Di Spikin” (Don’t be Sweet Talked) and “Di Hadapan Tai Matjan” (In the Presence of Tiger Droppings). 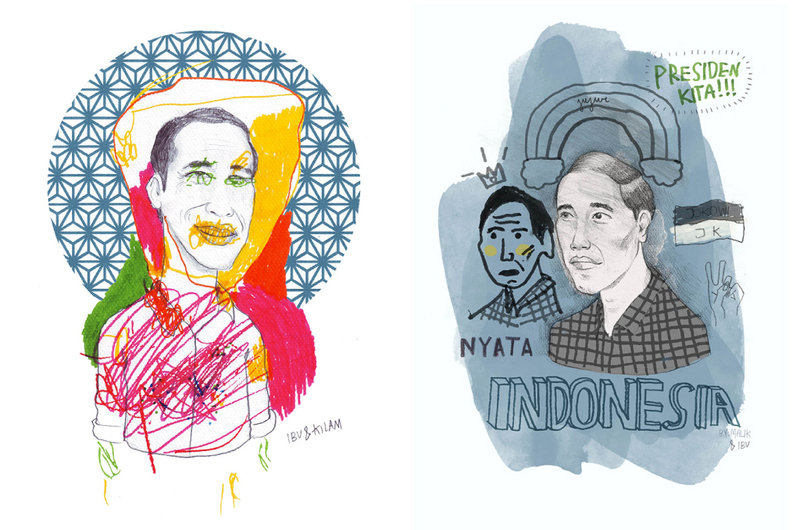 Most of the art posted on the website carry a message of optimism, and highlight Jokowi’s relatability to the common person. One of Dari Rakyat Untuk Indonesia’s contributors, Eric Wirjanata of Deathrockstar, created a series of Jokowi portraits donning different costumes – from The Flash’s red bodysuit, Kamen Rider’s armor, to Obi Wan-like Jedi garb. Eric explains that he was inspired by the Jokowi Gerak Cepat (Move Fast) campaign, so after he created a portrait of the PDIP candidate he dressed him as various superheroes known for their speed (Flash, Quicksilver), but as time moved on he decided to try different themes and costumes for the PDIP candidate including an Indonesian favorite, Unyil, and now there are 13 in the series. As elections are often associated with heated arguments and smear campaigns, Dari Rakyat Untuk Indonesia are part of a group of efforts with a positive take – inviting and inspiring the youth to participate in the public discussion. Regardless of who wins the race, we hope there will be more campaigns of this nature in the future. Click the following hyperlink to visit and contribute to Dari Rakyat Untuk Indonesia (submission is open until July 9th), and do not forget to use your right to vote on July 9th, 2014 (7:00 – 13:00).